How Come More People Don’t Die Exercising? 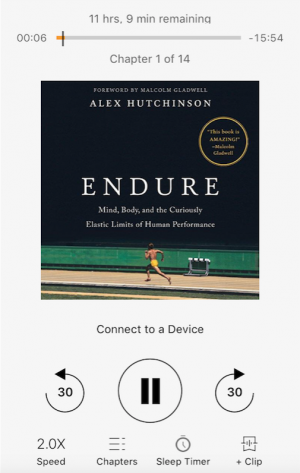 Today is a must read episode Endure: Mind, Body and the Curiously Elastic Limits of Human Performance by Alex Hutchinson. Hutchinson tries to tackle this complex question, why is it that more people don’t die doing exercise or maybe put a different way, if you run a race and give it everything you’ve got and come in second by say 1 second, why are you still alive? I mean you still have energy left over, because you’re still able to walk around, you may be dehydrated, but you’re not so dehydrated that you’ve turned black and gaunt, unless this hypothetical situation is a silly 200 mile ultra marathon, presumably you could still live another day or two or more without drinking anymore water and why is it that many people, not just people, but ‘experts’ said it would be impossible to run a sub 4 minute 1 mile run, then in 1954 Roger Bannister just barely did it by 6 tenths of a second, but since then it has been broken over 1400 times and the record now stands about 17 seconds lower or faster than that, but Hutchinson says, ‘Why stop there?’ Why can’t these same people carry that same pace for 26 miles or a full marathon? What are the limitations or more accurately how does our brain put limitations on what we’re capable of? What is the maximum human potential for full human speed and endurance and why or how is it regulated? When I first heard about this book, I thought the answer was really straight forward, well we get our energy from fats and carbohydrates. Everybody has a genetically predetermined maximum potential or a maximum rate that you can turn those energy sources into useable energy, of course you can train your body to be more or less efficient with consistent exercise or lack of consistent exercise. All other things being equal the person who is the best or most efficient at turning energy into movement will be the fastest person. However, the more I got into this book the more I realized something else is going on and the more interested I became in hearing about it. Let’s look at my simplistic view of it, what I just described is your body’s ability to turn fat and carbohydrates into energy and is commonly referred to as your VO2. When we’re talking about endurance or cardiovascular training this is a major component of exercise. We can measure the amount of oxygen your body takes in and the amount of carbon dioxide your body expels and get a fairly accurate measurement of how many calories you burn, what percentage is fat and what percentage is carbohydrate and an overall look at how much oxygen you consume to do this. The more oxygen you consume the higher your VO2 the better your body is at turning its fuel sources into energy, the faster you can go, at least in theory, because there are two other basic factors I haven’t talked about, running economy or efficiency (This could be swimming, cycling or cross country skiing, any sport endurance sport, but I’ll use running as the example to keep it simple) which looks at your technique as a runner. We also have to consider your anaerobic threshold or your ability to exercise at the highest intensity possible without slipping into the anaerobic or non-oxygen energy system, when you exercise you’ll be familiar with this, it doesn’t matter what the cardiovascular exercise is, but if you’re trekking along slowly increasing your speed, you will eventually reach a point where you have to start slowing down, this will come very quickly if you’re sprinting or a better example might be if you decide to go out for a 20 minute run, but after 7 minutes you have to stop and walk, which means you went out too fast or too hot and you quickly jumped into the anaerobic zone, which is a great place to be if you’re trying to burn a lot of calories, but not a great place to be for going long distances really quickly. Hutchinson takes a look at all these contributing factors, plus the brain and some other subsets, like nutritional choices and equipment, because simply put why is it that two runners, one has an extremely high VO2 max, very strong running economy and can exercise at a very high percentage of that VO2 max and then take someone else with a high, but not as high a VO2 max, running economy that is really good, but isn’t as good as the other guys and they can somehow still wln a race. What are these differences? Do we have a nondescript self governor that operates in our subconscious background that is very good at estimating how we need to pace ourselves to not over do it? Do some race strategies just lend themselves to being more effective on some days, when your stars just happen to align and all your training comes together to create the perfect race? Is it something more physiological with red blood cell and mitochondrial fluctuations that shift just enough day in and day out that some days we are just destined to be extraordinary? VO2 max is important, but it’s not everything……the percentage of VO2max you can go at for sustained periods of time counts as well, and good running economy really helps, but that’s basically it. There’s still a debate about energy sources and the best way to eat, debates about how important or not important dehydration actually is, how can running economy become even more effective, runners are getting shorter, skinnier and have access to better equipment and don’t even get me started about a person’s willingness to suffer, to subject themselves to unimaginable self-inflicted pain or understanding consciousness at large, because we are centuries or more away from understanding consciousness, but to me that’s what makes this so interesting, what baskets do we put our eggs in, who’s right and who’s wrong, are we all right or all wrong and for you dear listener what does it all mean? It means if you’re looking for answers this is not the book for you, but on the other hand I don’t think the answers book exists yet, but what this book gives you is a plethora of things to consider, what makes people fast and faster or fast then slower? Throughout this book Hutchinson does a really good job of sorting through the literature, trying to look at it from different angles, he uses stats and stories that support the material, then he’ll come up with stats and stories that challenge it and he definitely challenges conventional thinking and theories that are not technically backed by science. I think this book is worth it just for that alone, he sets the record straight on sport drinks and dehydration, he lays the ketogenic diet out as it relates to performance, spoiler alert it goes like this, if you want to go fast the ketogenic diet is not for you, if you want to go far, it could be but the research is mixed, your best bet, eat ketogenically sometimes or do spurts of eating ketogenically and this helps your body switch between energy sources, this is called metabolic flexibility, maximizing your ability to perform. In retrospect this book might be worth it for the chapters on diet alone, but he also goes deep into the mind over matter aspects of training and there are several chapters on brain function while exercising. Games you can play or brain training you can do to get used to the monotony of endurance exercise there are also strategies or tricks you can use on yourself to make exercise more enjoyable, quick tip if you dislike exercise or it hurts try smiling when you do it, you don’t have to be happy, but if you smile, you will be able to do more on less perceived effort, and who doesn’t want more for less or at the very least to make exercise more enjoyable? Wouldn’t you exercise more if you found it more enjoyable I know I would and I already kind of like exercise, imagine what it could do for someone who doesn’t like it at all? Anyways, I think you get the point, I’m starting to ramble, if you’re interested in the science behind our limiting factors with respect to exercise, are confused about the different approaches you could take when you train or if you’re looking for some tips and tricks to make exercise more enjoyable I definitely recommend this book, Endure by Alex Hutchinson – of course I will have a link in the show notes if you really want to get after it.